Hello people of the internet!!! On today’s ‘YouTube Wednesday’, we’re going to talk about a PHENOMINAL singer/songwriter who you will completely fangirl (and fanboy) over from the moment you hear her. If you haven’t stumbled across one of Rebecca Shearing’s AMAZING covers then you have no idea how deprived your ears are. Not only can she sing and play the piano, but she also has the ability to perfectly tackle any genre of music and make it sound completely fresh and unique. So now let’s get to what y’all are waiting for, the music! Ready? Ok, let’s go!!! The first video that we’re going to talk about is Rebecca’s cover of ‘Happy’ by Leona Lewis, which was uploaded on January 30th, 2010 (you can check out the video below). I thought that this was an awesome video to kick things off with, because the song is not only technically challenging but should make you experience the feels when you listen to it. Rebecca does a really good job displaying her vocal skills in this cover, and it definitely makes you eager to see what she’ll tackle next. The next video that we’re going to discuss is Rebecca’s rendition of ‘Gangnam Style’ by PSY, which was uploaded on October 15th, 2012. When I saw this video, I was immediately intrigued, and honestly it was everything I thought it would be and so much more! Rebecca did an AMAZING job rearranging this song into a cool jazzy rendition that will give the song a really fun, fresh vibe. It’s a fun play on this viral hit, that will have you addicted to ‘Gangnam style all over again. 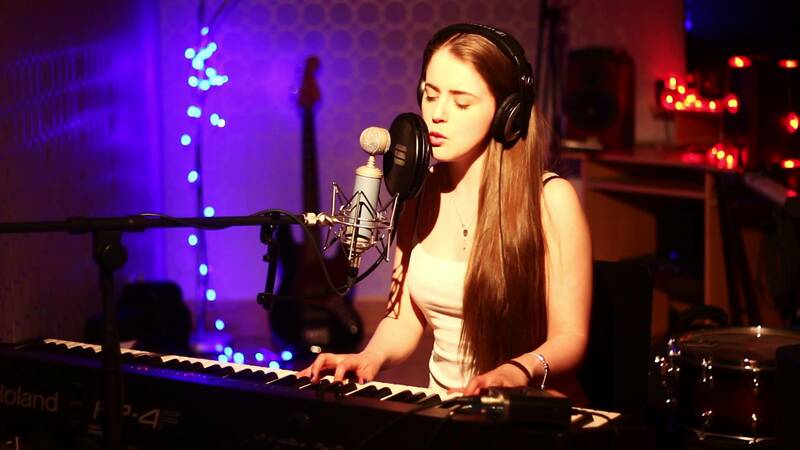 Next up, we have Rebecca’s cover of ‘Just Give Me a Reason’ by Pink feat. Nate Ruess, which was uploaded on March 25th, 2013. In this cover Rebecca really showed off her artistry, by fully engaging herself in the song, and bringing out the emotions that the lyrics of this song have. The fact that Rebecca was able to show that she’s an amazing storyteller in this video, only makes me more excited see what incredible original music she releases in the future. The final cover that we’re going to discuss is Rebecca’s cover of ‘Flashlight’ by Jessie J from the Pitch Perfect 2 soundtrack, which was uploaded on June 12th, 2015 (and you can check out below). This was such a breathtakingly beautiful cover, and will make you become even more obsessed with Rebecca’s channel. This video really proves that Rebecca has continued to perfect her craft, and now is not only able to sing/play the piano EXTREMELY well, but is also a true artist that will captivate your from the first not to the last, and will leave you constantly wanting more. With all the growth we’ve already seen from her, I can’t wait to see where Rebecca’s career takes her next. All credit goes to YouTube, Twitter, Facebook, Rebecca Shearing, rebeccashearingoffical.com, Leona Lewis, Syco Records, J Records, Evan Bogart, Ryan Tedder, PSY, Universal Republic, School Boy Records, YG Entertainment, Park Jae-Sang, Yoo Gun-hyung, Yang Hyun-suk, P!nk, Jeff Bhasker, RCA Records, Nate Ruess, Jeff Bhasker, Republic Records, Jessie J, Sia Furler, Christian Guzman, Jason Moore, Sam Smith, Pitch Perfect 2, Elizabeth Banks, Kay Cannon, Mickey Rapkin, Mark Mothersbaugh, Jim Denault, Gold Circle Films, Universal Pictures, and any other original owners involved and/or mentioned in any of these videos, any and all companies, individuals, and/or businesses that should receive credit for anything mentioned in this blog post, and all original owners. I do not own anything in this blog. If any people, corporations, businesses, companies, etc, were not previously given credit for their work, they are given credit now and their previous absence was unintentional. All opinions expressed in this blog are my own. I wrote this blog for entertainment purposes and no copyright infringement is intended. celindareyesblog July 1, 2015 No Comments on YouTube Wednesday: Rebecca Shearing…the singer/songwriter who is changing the music game one cover at a time. Category: YouTube Wednesday. Tagged: artist, Christian Guzman, Elizabeth Banks, Evan Bogart, facebook, Gold Circle Films, J records, Jason Moore, Jeff Bhasker, jessie j, Jim Denault, Kay Cannon, leona lewis, Mark Mothersbaugh, Mickey Rapkin, music, musician, nate ruess, p!nk, Park Jae-Sang, Pitch Perfect 2, PSY, RCA records, Rebecca Shearing, rebeccashearingoffical.com, republic records, Ryan Tedder, Sam Smith, School Boy Records, Sia Furler, singer, songwriter, Syco Records, twitter, Universal Pictures, Universal Republic, Yang Hyun-suk, YG Entertainment, Yoo Gun-hyung, youtube, youtuber.